What if Mr. Darcy’s mother was still alive? What if the Bennet sisters had suitors who were unacceptable? What if Elizabeth didn't realize Darcy's identity? 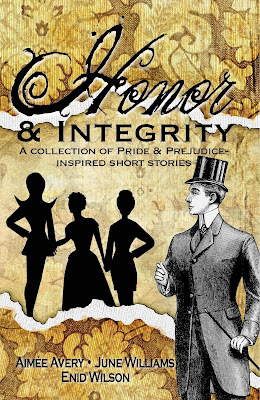 And what if three authors of Jane Austen-inspired stories put their heads together and challenged each other with creating stories which contain the words ‘honor’ or ‘integrity’? This collection of nine short stories contains sweet, romantic and intriguing stories across Regency, fantasy and modern genres. You can find steampunk, deception, manipulation, theft, murder, love, marriage, coffee and many more themes in this volume. “Come, Elizabeth Bennet, I have 98.6945% of yearning to show you my birth chamber.” Wickham grinned as he pulled Elizabeth along some unknown corridors in Pemberley Corporation. “Wait, George, you’re going too fast! And what are you talking about? Birth chamber?” Elizabeth shook her head at the enthusiasm of the strange, handsome man. She had worked at Pemberley Corporation for the past two months as a public relations Vice President. The job put her in daily contact with Darcy and Bingley. She didn’t like the overbearing and arrogant Mr. Darcy one iota. He stared at her all the time, to find the fault most probably, and kept trying to separate the charming George from her. Wickham might have strange vocabulary and manner, but he was polite, gentlemanly and had the hots for her, the exact opposite of Mr. Darcy’s treatment of her. She teased her CEO verbally whenever she had the chance, which seemed to be a lot of time, as Bingley was dating Jane, and they usually invited Darcy and her to tag along. “There!” George stretched out his hand, gesturing to Elizabeth to admire the magnificent set up in front of their eyes. Elizabeth’s mouth gaped open. Inside the room was an enormous circular structure, the size of a football field and height of a 7-storey building, resembling the interior of a spaceship from a science-fiction movie, with many computers, electronic devices, and monitors. While the machines blinked and processed data busily, the room was devoid of occupants. She stepped outside the corridor to make sure it wasn't her imagination. No, it was real: from the Pemberley Corporation corridor, this was just an ordinary room, but once she stepped through the door, it was a colossal structure. Lizzy was reminded of a British television show about an alien who traveled inside a police call box that was really a spaceship. “What is this place?” She cranked her head, trying to read the nonsensical content on the wall-to-ceiling computers as she moved into the room. George turned to press a few buttons on the wall by the door, and the banks of computers on Elizabeth’s right-hand side parted open to reveal an inner chamber with a sparkling pagoda-shaped structure, more extensive than her entire house, in crystals. A high-back reclining chair, fit for a king, also made in eye-blinding crystals, occupied the center of the pagoda. A palace inside a chamber? Did Mr. Darcy name them? Strange choice, she thought. With mouth gaped open again and feet seemingly moved by magnets, Elizabeth walked inside the crystal palace. She had never seen so many crystals in her life, and every one of them looked to be perfection under the spotlights. Tracing her fingertips along the surface of the wall, she thought about what George had just said. Did he mean he was not human? He was apparently created by G.E.O.R.G.E., the Genetically Engineered Organic Robot Growth experiment her father spoke a lot about. Darcy in 1821? From Derbyshire? Did George mean Mr. Darcy was a man from nineteenth-century England who funded G.E.O.R.G.E. and time travel? That couldn’t be true. Elizabeth was speechless and sat heavily onto the chair. “No!” Darcy’s high-pitched voice startled her. He charged towards her like a raging bull. Elizabeth swirled the chair to avoid the flying man, but he knocked the breath out of her. She felt dizzy and in great pain. What had Mr. Darcy done to her? Did he kill her with his sheer masculine weight because she had discovered his crystal palace? She could feel his virile body pressed hard against her. Her eyes flashed with sparks, but she saw nothing. Her body felt like it was splitting up, disintegrating into millions of particles, yet she could feel every inch of Mr. Darcy’s skin in her mind. After what felt like hours or days, the faintness stopped. Mr. Darcy’s husky voice made Elizabeth pry open her eyes. They were nose to nose. His mouth was inches from hers. Their bodies were pressed together, with her lying on top of him. He was holding on to her for dear life. “This can’t be happening,” he murmured. She scrambled off his body and fell to the ground. The unfeeling man with no manners left her there and walked out of the crystal palace and stood in front of some computers. She stood up, followed him and looked around. Was he crazy too? And where was George? The other man was no longer in the Quantum Chamber, unless he was hidden somewhere behind those banks of computers and high-tech pieces of equipment. He turned to stare at her, his face was bright red. “But who activated the time travel?” he said to the computer again. The book is out of print, but you can still read my stories on my website.